You can also do it yourself with readily-available and reasonably-rated car rentals. 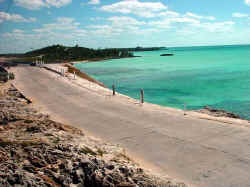 If you're from the US, it may take a little getting used to, as Bahamians drive on the left side of the road. But the benefits are obvious: you can travel at your own pace, stop when you want, and someone can always stretch out on the backseat.